Successfully Added Globe Outdoor Solar String Lights to your Shopping Cart. 1. Dusk to dawn sensor: Solar powered and rechargeable battery, turn on at dusk automatically. 2. Flashing & steady on modes: 2 switch buttons- Power On/Off & Mode Switch. 3. 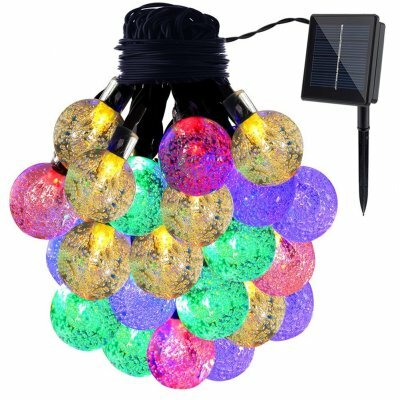 With 30 Leds: 6.5m/21ft 30 Leds Bubble Crystal Ball Lights, Four colors light and Lifespan up to 100,000 hours. 4. Waterproof: can withstand all kinds of weather, including heavy rain and snow, perfect for indoor and outdoor decoration. 5. Suitable for indoor and outdoor: these wonderful outdoor string lights illuminate during night, add warm and charming atmosphere to your gardens. Application: Home, Garden, Patio, Pathway, Street, Hotel hall etc. Occasion: Party, Holiday, Festival etc. Function: Night lighting and Decoration.